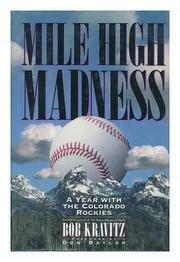  Major league baseball added two franchises (one in Colorado, the other in Florida) to its roster for the 1993 season. By all accounts, the new arrivals caused considerable excitement--a quality conspicuous by its absence from the drab narrative Rocky Mountain News sports columnist Kravitz provides about the Denver- based team's maiden year. In the course of his chronicle, the author touches all the bases, offering capsule commentary on many of the team's 67 wins and 95 losses (a stellar performance by expansion standards). In addition, Kravitz dutifully reports that nearly 4.5 million fans from the mile-high city paid to see the Rockies play their home games, setting an attendance record that could prove hard to break. Covered as well are the long-running efforts by local pols to put a big-time baseball club in Denver; the money woes of a succession of would-be owners; Andres Galarraga's National League batting championship; a rookie pitcher whose idiosyncracies could commend him to Ring Lardner; the loyal wives (or significant others) of players; Don Baylor (one of the game's few black managers); the financing of a new stadium; locker-room strife in the midst of a losing streak; and the spoiler role played by the upstart squad in a down-to-the-wire pennant race. Unfortunately, the author's by- the-numbers recitals soon pall, and his anecdotal vignettes never bring to life a high-stakes venture that seems to have paid off handsomely. Nor does Kravitz address the instant win-or-lose appeal of the Rockies, which, pro tem at least, has made the franchise a gold mine for its proprietors. Mile-high mildness. The pedestrian text has eight pages of photos--not seen.